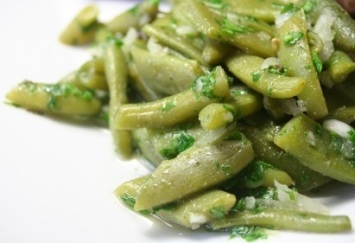 This green bean salad recipe is one of my favorite summer salads. It is a very simple recipe. Just boil up some green and/or yellow beans and while they are boiling mix together this light and savory vinaigrette. Cook the green beans in a large pot of boiling water until they are tender, but still just a bit crisp. Drain well and place the beans into a large serving bowl. In a mixing bowl, combine the olive oil, vinegar, vegetable stock or water, salt, cayenne pepper, dill, parsley and mustard. Mix all ingredients together well. Pour the dressing over the green beans and toss to coat. Chill for 1 hour before serving. This salad looks lovely if you use a mix of green beans and yellow or wax beans. Not a dill fan? Just leave it out. It will still taste delicious. You can make this salad with canned or frozen beans as well. I personally don’t think it tastes anywhere near as good as using fresh beans. I add the vinaigrette while the beans are still hot. That way the onions soften a bit and the vinaigrette soaks into the beans, making them really flavorful. Just chill the salad for an hour or two before serving and that’s it. It is an easy make ahead salad too. It can easily be made a day or even two before serving. Although we may think of this as a predominantly favorite summer salad recipe, and it is great for picnics and barbecues, it works really well on a buffet table at any time of year. The bonus? It’s a very healthy recipe too. This is a wonderful diabetic recipe. Green beans are a very low carb vegetable and this recipe is full of healthy ingredients – a perfect diabetes salad recipe. If you like this green bean salad recipe, you may also like our green bean casserole. Find it here.